So, back in the Roaring 20s, fabulous flappers everywhere bobbed their hair short to send a message to society: don’t you dare keep me under locks and key! The trouble was, all those short hairdos didn’t easily stay off of flappers’ faces as they smoked, drank, and Charleston-ed the night away. Enter the Jazz Age essential: the flapper headband! This must-have accessory kept hairdo's done-up but looked pretty dramatic, to boot. 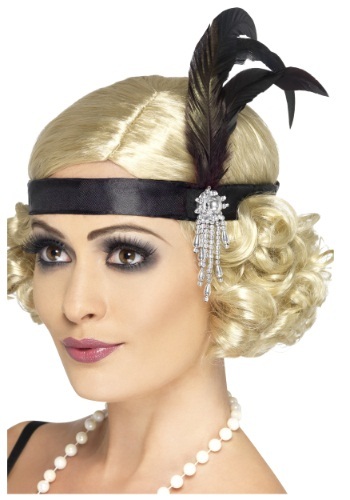 So basically, no self-respecting flapper would be caught dead without this Jeweled Black Flapper Headband; you don’t want your period costume to suffer from a lack of appropriate accessories, do you? Plus, this hair piece will have you looking downright ducky and enables you to dance to heart’s content while your bob stays perfectly coiffed. Bully for you!